Recognized as one of the top three festivals in Canada and, for the third consecutive year, a Songlines Magazine (UK) pick as one of the leading overseas music festivals, TD Sunfest ’18 celebrates 24 years of transfiguring downtown London, Ontario’s Victoria Park into a culturally diverse jewel for more than 220,000 devoted visitors from near and far. From July 5-8, more than 35 stellar world music and jazz ensembles from around the planet will perform on five stages, while approximately 225 exhibitors whet festival-goers’ appetites for scrumptious global cuisine and one-of-a-kind crafts and visual art. Foodies will be royally rewarded this summer thanks to two new specialty beer sponsors — London Brewing Co-op and Anderson Craft Ales — and the addition of a craft beer and wine garden. Festival organizers have spent much of the past year traveling the globe to meet with artists, agents and government representatives so that they could bring more of the world’s outstanding talent to the Forest City this summer (a record 22 international music and dance ensembles). Even before releasing the 2018 roster, organizers started receiving travel inquiries from as far away as Minneapolis and Seattle, and that’s because visitors know that the common denominator of TD Sunfest programming is always its artistic integrity and buzzworthiness. While few of the 2018 headliners are household names, most are iconic artists in their own countries. For example, revered Malian singer/guitarist Sidi Touré; the “Golden Voice of Mozambique,” Wazimbo; and the Nigerian godfather of afropop and funk, Orlando Julius & The Afro Soundz, or are fast-rising global stars like red-hot transgender band Liniker e os Caramelows from Brazil, East Los Angeles’s Latino bridge builders, Las Cafeteras, the Afrofuturistic Gato Preto from Germany/Mozambique, and UK Northern Soul sensation Hannah Williams and her band The Affirmations. TD Sunfest ’18 visitors will have an opportunity to see many of tomorrow’s stars today—while they are still trending and before they become unaffordable. 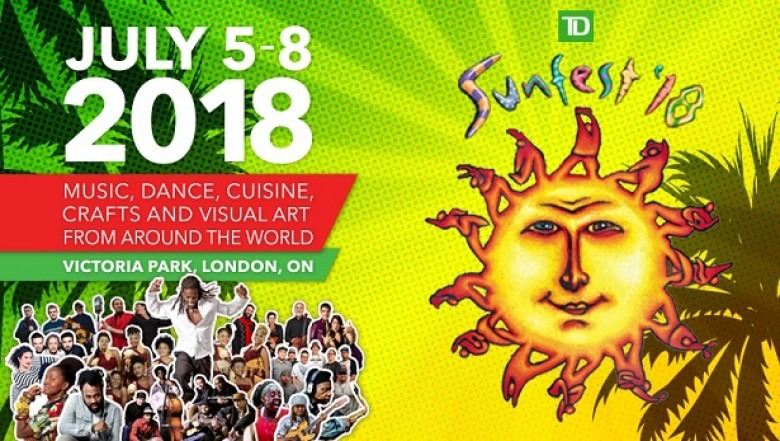 With internationals coming from as far away as Chile and South Korea—and Canadian nationals from as far away as British Columbia and Newfoundland—and with every performance free and accessible to festival-goers, TD Sunfest once again offers remarkable entertainment value. But beyond its ability to entertain and attract tourists is the fact that TD Sunfest remains the most beautiful expression of community in the Forest City. Londoners from all cultures and walks of life have truly embraced the festival and made it their own. For many, it’s the highlight of summer and even of the whole year. Because of the popularity of Lazo (“Mr. Sunfest”), the warm sounds of reggae have always had a special home at TD Sunfest. But, this summer they’re taking the steel pulse even higher by skanking to “Roots, Riddims & Reggae.” This new programming component (supported by the Government of Ontario) salutes not only reggae and its offshoots, but also other diverse music of the Caribbean, taking Sunfesters to Cuba, Haiti and beyond. Among the headliners are a sizzling 15-piece Cuban salsa band led by Alain Pérez (bass player with the late Spanish flamenco king Paco de Lucía) and several recent JUNO winners, including Exco Levi—one of Canada’s best known and most successful reggae artists (representing Jamaica)—and Kobo Town (representing Trinidad and led by “Calypso’s Crown Prince” Drew Gonsalves). And, two of the participating ensembles are all-female: eight-member Artiz from Haiti and seven-member Morena Son from Cuba. “What I like about Sunfest is that it encompasses so much of what both the world and local community have to offer. You can go and see the most outstanding acts in the world, and the next minute come across the most undiscovered, unheard of group ever,” said longtime Sunfester and Daytonian Jim Carter (a.k.a. Rev. Cool). The park will open daily at 11 a.m. during Sunfest, with opening ceremonies at 6:45 p.m. Thursday, July 5. Music will be featured from 6:00 to 11:00 p.m. Thursday, and Noon to 11:00 p.m. Friday through Sunday. Admission is free! For more information, please visit www.sunfest.on.ca, email info@sunfest.on.ca or call (519) 672-1522.